Your Smart TV is Watching You - and It's Not the Only One! Your Smart TV is Watching You – and It’s Not the Only One! Would you be worried if you knew that hackers could compromise your TV 5 Security Concerns to Consider When Creating Your Smart Home 5 Security Concerns to Consider When Creating Your Smart Home Many people attempt to connect as many aspects of their lives to the web as possible, but many people have expressed genuine concerns over how secure these automated living spaces actually are. Read More , your thermostat, or your lights? Open your garage door? Turn off your security system? What about if they were watching you through your smart cameras? That idea should make everyone very uncomfortable. Worryingly, hackers may not be the only group you have to be concerned about. The companies who make your smart home devices are watching you, too. 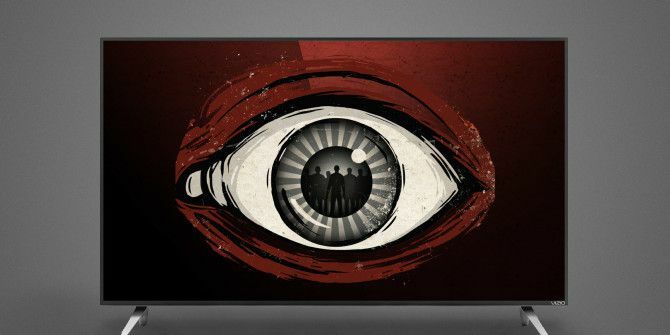 A recent Ars Technica article detailed how Vizio smart TVs are capturing information about you and transmitting it back to Vizio without telling you about it. Is this something you should be worried about? According to Ars, Vizio’s “smart interactivity” feature is turned on by default in over 10 million smart TVs, and this feature collects data on your viewing habits and sends them back to Vizio. This might not be surprising, considering how many of your daily activities are tracked How Much Does Google Really Know About You? How Much Does Google Really Know About You? Google is no champion of user privacy, but you might be surprised just how much they know. Read More , but Vizio is selling this information to advertisers who can then present ads to you on your other devices, like your computer and your cell phone. By connecting your viewing habits with your IP address, and your IP address to hundreds or thousands of other pieces of information provided by companies like Experian, advertisers now have even more information that they can use for presenting targeted ads Why Am I Seeing This Ad? How Social Media Ads Target You Why Am I Seeing This Ad? How Social Media Ads Target You Every social media site out there shows us ads. But sometimes, those ads can get very specific towards you, often showing you ads that seem creepy and stalkerish. How do they do that? Read More on all of your devices. Interestingly, cable and satellite TV providers are legally prohibited from selling this type of information; but because Vizio doesn’t fall into either of these categories, it can continue doing whatever it wants to with your data. And they’ll keep doing it unless you opt out of the service (you can see how to do that on Vizio’s site). What Other Devices are Monitoring You? The Amazon Echo (our review Amazon Echo Review and Giveaway Amazon Echo Review and Giveaway Amazon’s Echo offers a unique integration between voice recognition, personal assistant, home automation controls, and audio playback features for $179.99. Does the Echo break into new ground or can you do better elsewhere? 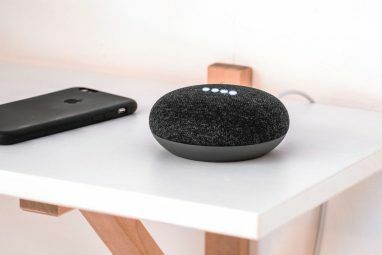 Read More ) is one of the devices that has smart home privacy advocates talking a lot – after saying the “wake” word, you can talk to the device and it will do things like find information for you online or help you order things from Amazon. But because it’s always listening for the wake word, it’s also always listening to everything else you say. And there’s no way to know what’s being recorded. It’s a safe bet that, at the very least, everything you ask the Echo will be stored and analyzed. Google Now, Siri, and Cortana are listening to you, too, especially if you use the “OK, Google,” “Hey, Siri,” or “Hey, Cortana” voice activation features. If your phone is listening for the activation phrase, that means it’s always listening. Google is definitely keeping very detailed records on you; you can even log into your Google account and see all of the Google Now requests OK, Google: 20 Useful Things You Can Say to Your Android Phone OK, Google: 20 Useful Things You Can Say to Your Android Phone Google Assistant can help you get a lot done on your phone. Here are a whole bunch of basic but useful OK Google commands to try. Read More you’ve made on your Google Now history page. That’s how easy it is to access that data (and that doesn’t even cover your full search history records). How much else are they recording? We don’t really know. Insurers are now partnering with smart home device makers to monitor the events in your house to verify claims or change your insurance rates, much like they currently do with automobiles Can Dashcams Stop 'Crash For Cash' Fraud? Can Dashcams Stop 'Crash For Cash' Fraud? The car in front of you suddenly brakes without warning... and you plough into the back of it. Read More . Canary is one of the companies sending data to insurance companies, and other security systems will like follow suit. Nest has partnered with insurance companies, and its voice control features mean it’s listening to what you say. USAA has patented a data recorder that transmits information on weather, vibrations, and electrical systems to help the company predict the likelihood of future damage to a home. The answer to this question depends largely on how much you trust companies with your data. Aral Balkan, founder of the ind.ie project, pointed out that Samsung manufactures not just phones and TVs, but also military and police equipment, meaning that the company has a close relationship with some of the groups that we’re nervous about being monitored by. And with big data leaks still fresh in recent memory, such as those from Experian / T-Mobile, Home Depot, JP Morgan Chase, Anthem, and Target, it’s easy to see why you might not want a technology manufacturer storing information like this on their servers. Even if you trust Samsung or Vizio, it’s likely that your information is being passed to third parties for transcription or other analysis. And who knows what their security standards are? In a world where we are increasingly valuable for the data we provide I Make $2000 A Year Selling My Personal Information, You Can Too I Make $2000 A Year Selling My Personal Information, You Can Too Don't be one of those suckers that sells their information for nothing! Read More , companies are going to continue monitoring our actions and thoughts as closely as they can in order to monetize us as customers. 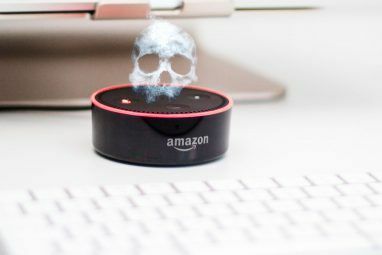 Whether you’re okay with this or not may largely shape your views on smart home devices being used to monitor homeowners. What do you think? Should we be worried about companies monitoring our activities through our smart home devices? Should they be forced to tell us up front about these sorts of things? Or does the responsibility lie with the user? Share your thoughts below so we can talk about it! Image credits: iko via Shutterstock.com, Information is Beautiful. Explore more about: Internet of Things, Smart TV, Surveillance. Should you be worried? YOU SHOULD BE TERRIFIED! I agree that the user has a lot of responsibility when it comes to knowing what's being collected and what the company is doing with it, but I also think that there's such a thing as a reasonable expectation of privacy. There's just no reason for people to expect to always be under surveillance by their products—that's just not a good way to run a business. Obviously I'm in the minority (at least among businesses), but I hope more people voice this opinion. The Borg Collective is here. Unfortunately all we get are the disadvantages with none of the questionable advantages. Every company, every organization, every governmental entity insist that they have a Constitutional right to watch us, collect any and all data about us, listen to our phone calls and read our electronic communications. In theory their motives and intentions are above reproach: to provide us with better service, to keep our children safe, to protect our country from enemies foreign and domestic, etc. In practice, their data collecting is making the worst of Cheka, KGB, Gestapo, Stasi, et. al. look like a bunch of rank amateurs. However, before we start complaining too loudly about lack of privacy, let's look in the mirror. We are very complicit in the erosion of our privacy. If we did not insist that every device we own, or may ever own, have Internet connectivity, these devices could not be used to spy on us. 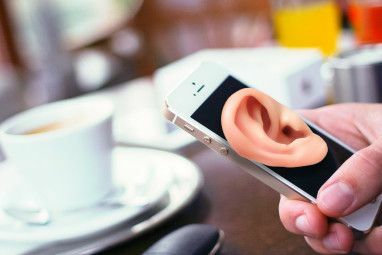 If we did not insist on being provided with information RFN, Google Now, Siri or Cortana would not be listening and recording any and all sounds their microphones can pick up. At this point, the only way to restore our privacy is a massive, world-wide, electromagnetic pulse that would wipe out all magnetic storage and disable all electric and electronic devices. "Samsung manufactures not just phones and TVs, but also military and police equipment"
I wonder what data Samsung is collecting from the military and the police? Or how do police and the military prevent Samsung from collecting data from them? You know, I never thought about Samsung collecting information from the military and police, or what safeguards those organizations might have in place to prevent that. I guess it's possible that Samsung would respect a contractual obligation to not record surveillance information because of the huge value of those accounts; if one person stops buying Samsung TVs, that's not a big deal, but if a country stops buying police equipment, that's a huge problem. Hm. I might have to look into that.